Turning gaming on its side. 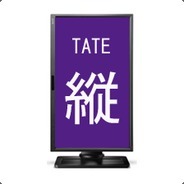 The purpose of this group is to identify games that natively support "tate" mode (from the Japanese word for vertical ( 縦 ) pronounced "tah-tay"), that is, a vertical monitor setup. This usually means a vertical shmup. It is also to provide support and monitor setup suggestions for those who like their gaming experiences...elongated. Psyvariar Delta now on Steam! Finally, another decent TATE mode shmup lands on Steam. It's been too long. Truth be told, I JUST bought this on the Japanese PSN store over Xmas, previously the only way to get this game overseas short of a physical import, as far as I know. However, this looks really promising. I think 30 bucks is a bit steep, so I will wait for a price drop to 20, but as soon as it hits, I'm snagging it. RAIDEN V: DIRECTOR'S CUT ANNOUNCED FOR STEAM! UFO Interactive have announced they're bringing Moss shmup Raiden V to Steam in a glossy repackaged Director's Cut. This is great news to me since, as an Xbox philistine, I've not had the chance to play it as it languished away on the platform for over a year. No word on TATE mode yet, but given how awesome Raiden IV was, I can't see how it possibly wouldn't support it. There's no Steam page yet, but Genmatsu report that the game will release sometime this fall. Between this and Castle Shikigami, it's great shooting ahead for TATE mode enthusiasts on Steam. "Games that natively support a vertical or portrait monitor setup, i.e. TATE mode. This usually means, but is not necessarily limited to, vertical shmups." What's taters, Precious? What's taters? !